Most of the time, entrepreneurs spend their days in a professional work setting. The same one every day. They practice the same set of skills and get used to them in their day to day environment. This is how stagnation starts. Over time new things become intimidating and people forget how fast they can learn new tools, prototype products and acquire new skills. All of which are at the core of the hackathon. 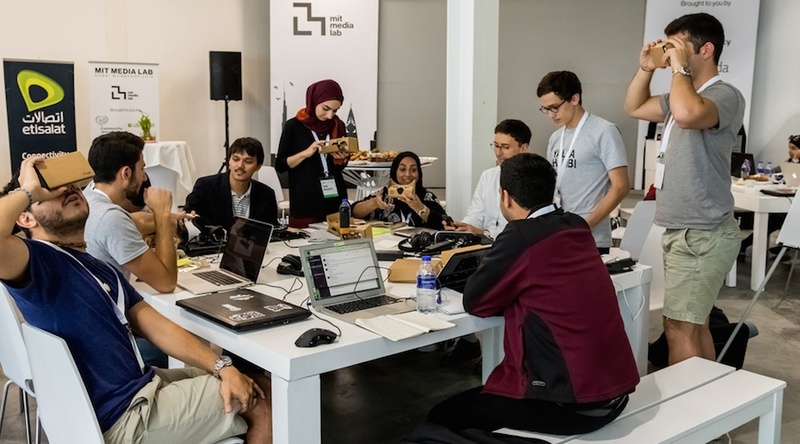 During the five-day MIT Media Lab workshop in Dubai, hosted by Community Jameel and Wamda, we spoke to a number of entrepreneurs, students and professionals about the things they had learned from past hackathons and their expectations for new ones. The things they loved most was how hackathons remind you that everything is possible and reachable. Being a kid again. You learn to let go of any expectations in order to embrace the process. Individuals aren’t judged for having silly ideas, because it’s all part of the creative process, so teams can develop ideas they didn’t think were possible in addition to finding innovative ways to realise them. “This was the first time I felt I had sky as the limit. Even if I shared the craziest ideas I was not judged,” - Yazan Fanous, a mechanical and industrial engineering graduate from the American University of Beirut. Adapting to new mindsets. The variety of skills and the different backgrounds and cultures of their teammates force attendees to accept very new ideas. There are as many mindsets as the number of people on your team, which can provide many insights into the same problem. You’ve got to lose any stubbornness, get out of your comfort zone and trust in the process and the team. There is no time to argue with others or even with yourself. Sticking to specifics. You’ve got to make a decision on ideas quickly. Listening more carefully and narrowing the options fast helps to train the mind on how to focus on the good ones. Different formats of exchange from coffee talks to organized discussions to lectures from professionals, open up the mind to more focused ways of thinking. “You learn a lot of ‘career’ skills as well, you get an idea of what would be the next skill you want to acquire and learn for your upcoming career path,” - Marwan Ghamloush, high school student. Building like ‘The Flash’. The ideation and innovation process when you’re putting something together quickly using new tools can be surprisingly fast. It’s a skill to work under time pressure, and hackathons force you if nothing else to work against the clock. Co-creating. Hackathons give you a chance to experiment with different types of media, from computers and physical tools, to drawing and maybe even 3D printing. A varied team means varied tools and skills, which also means attendees are exposed to new tools and get to learn about using new software in order to synchronise on a group level. “Most of the time coders code alone, it is a different world when you code together,” - Andrew Yip, PhD student in renewable energy at KAUST. This is the beauty of co-creating. Every time you will learn something new, master a new skill, generate new ideas. You will never be disappointed.